If a qualified individual reasonably believes that financial exploitation of an eligible adult may have occurred, may have been attempted, or is being attempted, the qualified individual shall promptly notify Adult Protective Services and the commissioner of securities (collectively “the Agencies”). Section 3 mandates reporting to a jurisdiction’s securities regulator (or like agency) and to a jurisdiction’s APS (or like agency) whenever a qualified individual “reasonably believes” that financial exploitation of an eligible adult may have occurred or been attempted, or currently is being attempted. “Reasonable belief” is intended to be both a subjective and objective standard – i.e., a qualified individual must have a subjective belief in the existence of the financial exploitation, and this belief must be objectively reasonable. Section 3 requires a notification when a qualified individual reasonably believes financial exploitation “may have” occurred or been attempted. The presence of the “reasonable belief” element in Section 3 should limit the number of unsubstantiated reports. Violations of Section 3 would be actionable by state regulatory authorities. Because the Model Act is drafted for potential adoption as a statute or as a regulation, jurisdictions should determine whether any appropriate conforming provisions are required to clarify the appropriate regulatory authority for enforcement of Section 3 and the potential consequences for violations. The issue of mandatory versus permissive reporting received significant comment from the public. [i] Some commenters, primarily industry trade groups, advocated for a permissive reporting standard while others, including consumer advocates and adult protective service professionals, supported mandatory reporting. The Seniors Committee carefully weighed the arguments and ultimately declined to shift to a permissive reporting regime on the grounds that the reporting mandate in Section 3 is indispensable to the Act’s goal of enhancing protection for seniors and other vulnerable adults. Far too many instances of elder abuse go unreported. [ii] A mandatory reasonable belief reporting requirement coupled with immunity for reporting provides an appropriate balance of incentives to encourage broker-dealers and investment advisers to report potential financial exploitation. Time is of the essence when one considers financial exploitation, as it is often accompanied by some other form of elder abuse or neglect. Mandatory reporting ensures that the proper regulatory agencies are alerted to cases of potential financial exploitation as early as possible, when their intervention may be able to prevent harm or limit the damage to victims of financial exploitation. The ability to have a regulator assess the situation and determine whether additional resources should be brought to bear is also a key component of any approach intended to provide meaningful protection to vulnerable investors. 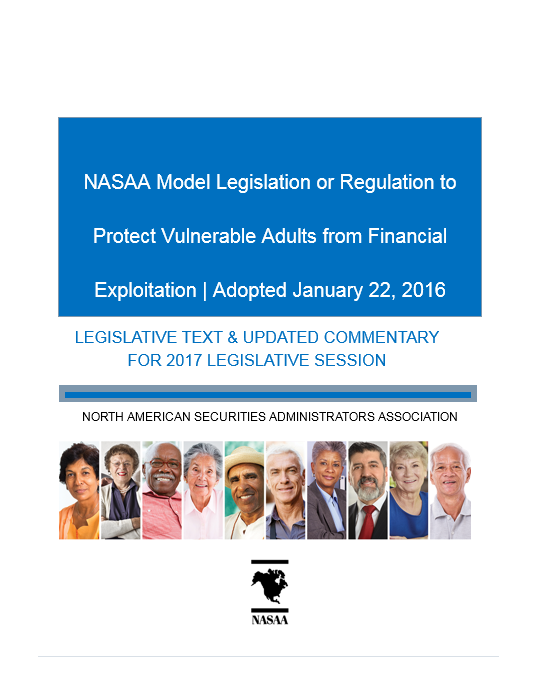 [i] Numerous states have enacted laws that mandate reporting of suspected elder financial exploitation by banks and other financial institutions prior to the Model Act, including California (Cal. Welf. & Inst. Code § 15630.1), Florida (Fla. Stat. § 415.1034), Georgia (Ga. Code § 30-5-4), Kansas (Kan. Stat. § 39-1431), and Mississippi (Miss. Code § 43-47-4). [ii] According to the National Association of Adult Protective Services (NAPSA), only one in 44 cases of financial abuse is ever reported. See: napsa-now.org/policy-advocacy/exploitation/.